“More than 10,000 union members and supporters swarmed the State Capitol here,” began an ecstatic People’s World, describing the scene in Annapolis, Maryland. The masses assembled “to protest proposed changes to teacher’s pensions and to respond to the recent attack on unions in Wisconsin.” The CPUSA organ was there, reporting triumphantly, ready to storm the Bastille, arm-in-arm in solidarity with the workers against their evil oppressors. The rally began at 6 p.m. as people began filing into Lawyer’s Mall in front of the Statehouse, arriving from all corners of the state. When the mall was full and barriers broken down, people resorted to climbing trees to fit in. That’s when the marchers arrived. Another 7,000 or so people came marching from the main boulevard. Standing at one end of the rally it was not possible to see the end of the procession that packed the whole four-lane street. The police ended up blocking traffic for blocks to accommodate the crowd…. A local veteran of the labor movement at the rally said, “I’ve been coming to labor rallies in Maryland for over 25 years and I’ve never seen anything like it.” … Another participant was a self-described “conservative” debating the merits of capitalism and the free market. Still, he was so energized by the recent movement by labor that he wanted to come support it…. The crowd roared. Trumka rallied the proletariat. “Tax the rich! Tax the rich!” chanted the workers. And, yes, it’s only the beginning. Yesterday’s demon was Scott Walker in Wisconsin, transmogrified into all sorts of political Frankenstein’s: Hitler, Franco, Louis XVI, Attila the Hun, Torquemada, Charles Manson, Jeffrey Dahmer. Now, in Maryland, it’s someone, or something, else. With a Democratic governor there, the target morphed into the natural enemy of the folks at People’s World and their Daily Worker grandparents: the rich generally, the bourgeoisie, markets, “profits,” capitalism. 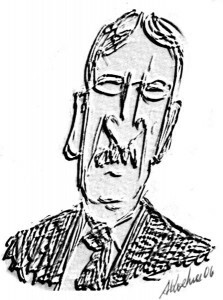 But the one specter not on display at these rallies, from Madison to Maryland and beyond, who is really the godfather of the teachers’ front, is the late John Dewey. If I may, I’d like to share some badly needed words on the late Columbia professor, who is at least partly responsible for delivering the teacher mobs. Professor Dewey’s impact on education over the past 100 years is difficult to overstate, especially through the instruction and training of college students to become public-school teachers. He is the father of modern public education. In fact, Dewey is often claimed as “father” of a number of concepts, some of which overlap or are confused, from “pragmatism” to “experimentalism.” We see the spirit of Dewey in the constant experimentation that prevails in the classroom, the never-ending, always-changing search for new methods, programs, terms, fads and fashion, and “research” into “improving” education. Not only does such thinking maintain a hold on educators, but so does the sharp secularism and post-modernism. Dewey favored that, too; when it came to rampant repudiation of moral absolutes in public schools, Dewey was ahead of his time. This Deweyan view conformed to his broader vision for society and the world. Reality itself, the environment itself, progress itself, is always moving onward, never satisfied at its present state. A process of constant, ongoing flux and “reform” is always at hand. This is the essence of the political progressive. In all, Dewey’s specter thrives. No doubt, his disciples will never go unneeded, if not unemployed, whether in the classroom or training teachers for the classroom, whether in educating or researching education, since experimentation and change is their modus operandi. There will always be something new to conjure up, with the one constant being the youthful guinea pig. Taxpayers should shut up and fork over the bucks to subsidize the common good set to gush forth. Finally, and especially significant, in light of today’s politics and education, Dewey judged that pursuing change through politics was frustratingly slow; doing so via education could be much quicker. This was a central theme in his best-known work, Democracy and Education (1916). The schoolhouse could be more efficacious than houses of legislatures. That is no small point: It was the clarion call that compelled so many ’60s radicals to earn graduate degrees in education, making them today’s tenured professors. These revolutionaries ultimately eschewed politics for education. Given their extreme ideas, Americans would never dare elect them, but young people had no choice but to take them seriously in the classroom. Consider the case of none other than Bill Ayers. In the 1980s, John Dewey’s celebrated home was there to roll out the red carpet for the communist radical and domestic bomber. Ayers had spent the previous decade fleeing the FBI as a fugitive. He wrote some of the most violent, insane screeds ever published in the United States. And after all that, Columbia Teachers College offered him admission. Ayers deemed it a good fit; the college agreed. He earned his doctorate there. Ayers became a tenured professor of education at the University of Illinois-Chicago, authoring (among other works) books on teaching “social justice,” published by — you guessed it — Columbia Teachers College. Ayers followed the pattern of countless former SDS and Weather Underground fanatics, including his bride, Bernardine Dohrn. They went into education. There’s much more that could be said about John Dewey and his influence, including the completely neglected fact that the man was adored by the Soviets. During the height of the Russian Civil War, the embattled Bolsheviks wasted no time translating Dewey’s works into Russian. In 1921, the Soviet government published a 62-page pamphlet excerpted from Democracy and Education. This classic of American public education was a Bolshevik phenomenon. That thought deserves pause: Democracy and Education stands as John Dewey’s most significant work; it remains the most common choice of schools of education. It became the bible of Columbia Teachers College. It has long served as the guidepost of education departments. It was the book where Dewey himself attempted to summarize his “entire philosophical position.” Liberals and progressives swear by the book. And it was a Bolshevik favorite. The admiration was mutual, as Dewey reciprocated. He made a pilgrimage to the Soviet Motherland in the summer of 1928. A totally duped Dewey returned and filed a six-part series for The New Republic, raving about the “experimentation, the “progress,” and the “Great Experiment” he encountered in the land of Lenin and Stalin. This is just the tip of the iceberg — as cold as Siberia? — on how Dewey’s ideas were embraced by the Soviet totalitarian education system. I could say much more. Of course, needless to say, none of this history is taught by Dewey’s disciples today. These are inconvenient facts, not worthy of educational progressives’ time. They have time for other things right now. Witness Madison and Maryland. To that end, such things regarding Dewey are not being mentioned — but are certainly present — at the rallies from Madison to Maryland and beyond, where Dewey’s disciples are in their natural element. That’s too bad. It’s not Scott Walker that’s the true face of these rallies, not Hitler or any other demon conjured up by our educational “progressives.” The poster child for these protests is the late professor from Columbia University. Dr. Dewey’s notions continue to thrive.